Ditch the boxed brownie mix, as this recipe for Easy Homemade Brownies makes fudgy, soft, moist brownies full of rich chocolate flavor! This truly is the recipe for the BEST brownie! 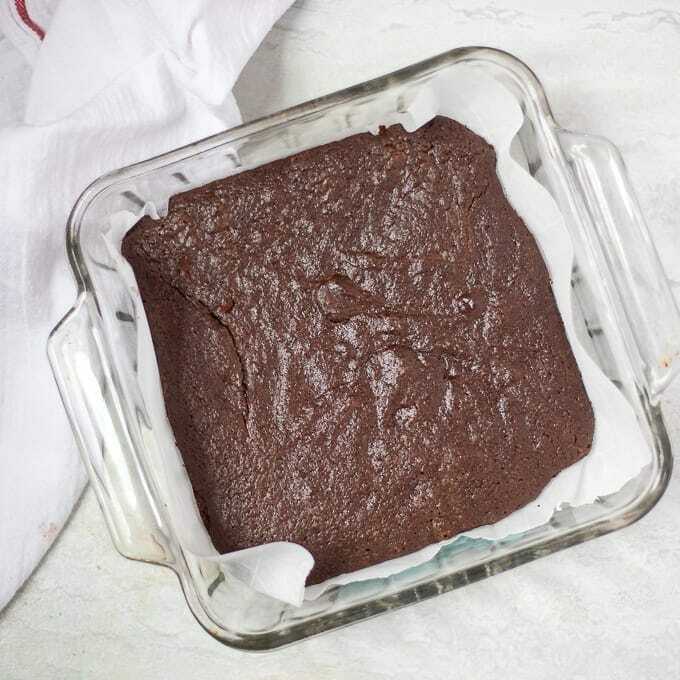 If you are looking for a healthy brownie, check out my Black Bean Brownies. If you are looking for more delicious chocolate desserts, check out Neiman Marcus Cookies, Oatmeal Chocolate Chip Bars, or Chocolate Peanut Butter Rice Krispies. If you offered me a piece of cake or a brownie, I would choose a brownie every single time. To me, nothing beats a brownie that is rich, fudgy and gooey. 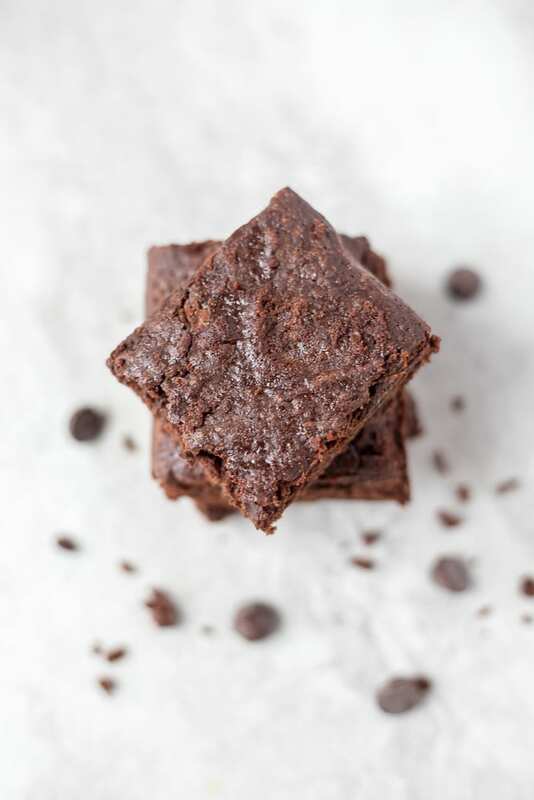 Some people shy away from making brownies at home, because let’s face it, those boxed Brownie mixes are not only easy to make, they are pretty tasty as well. However with a few tips and tricks, you can have homemade brownies that are ALMOST as easy as boxed brownies and TASTIER. The secret to the best brownies is espresso powder and vanilla extract. Both vanilla and espresso powder work to boost the rich chocolaty taste in the brownies. You don’t taste the espresso–you simply taste rich fudgy chocolate. YUM! Another key when it comes to making homemade brownies is to not over bake. Simply bake the brownies until JUST set–after all, gooey, fudgy brownies are the BEST! In small saucepan, melt butter over low heat. Add in espresso powder and sugar and whisk to combine. Cook over low heat for 2-3 minutes, until sugar begins to melt into butter, whisking often. It is okay if espresso powder does not dissolve fully. Remove from stove and let cool slightly, while you sift dry ingredients. Sift flour, cocoa powder, salt, and baking powder into a large mixing bowl. Add in chocolate chips and toss to coat. Add butter mixture and eggs to dry ingredients. Mix together with wooden spoon or spatula until JUST combined. Do NOT overmix or brownies will become tough. Line square glass baking pan with parchment paper. 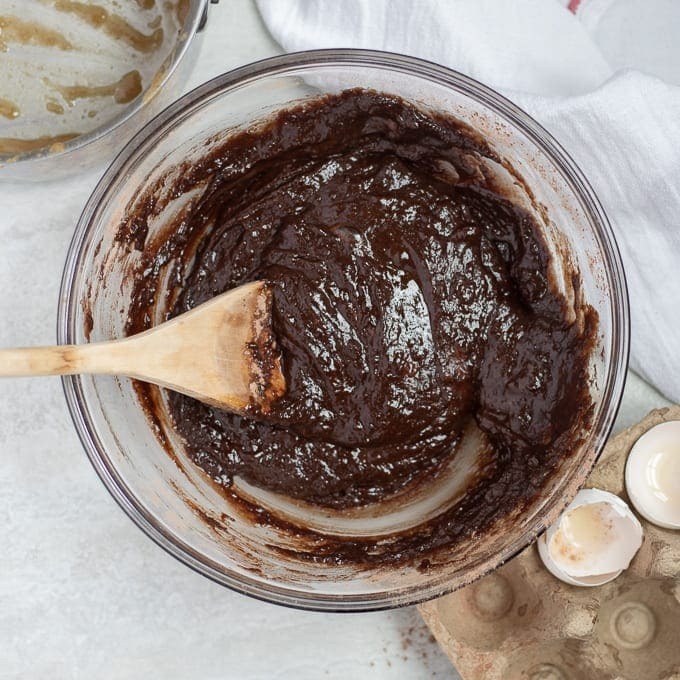 Pour brownie batter into pan and spread gently for brownie batter to be evenly distributed in pan. Bake brownies until the center is set, but still soft. A toothpick will come out clean with a few crumbs still attached. Once brownies have been removed from oven, let cool in pan for 5 minutes. Gently lift parchment paper from pan and allow to cool on rack for 5 to 10 minutes. To store any leftover brownies, place into air tight container (I use the baking dish fitted with a lid) and store at room temperature for 3-4 days. To serve a leftover brownie warm, simply microwave for 10- 15 seconds. 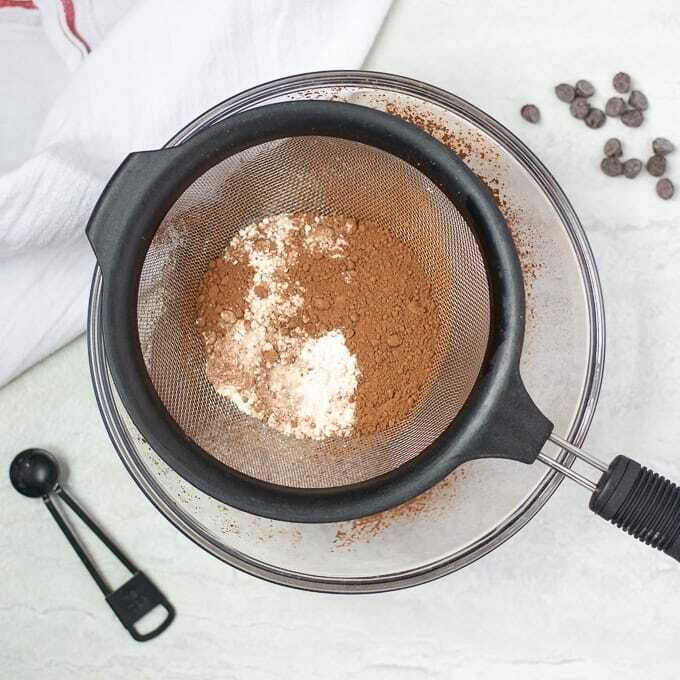 It is so important to sift your dry ingredients, as cocoa powder can form lumps in your batter that will not taste good in the final product. Be sure to use cocoa powder that is JUST cocoa powder and check the date for expiration. Be sure to use UNSALTED butter, not salted butter. The added instant espresso powder helps to really make the chocolate flavor stand out. Feel free to omit or use decaffeinated espresso powder as well. It is NOT necessary to use parchment paper to bake these brownies, just makes them easier to remove from baking pan. 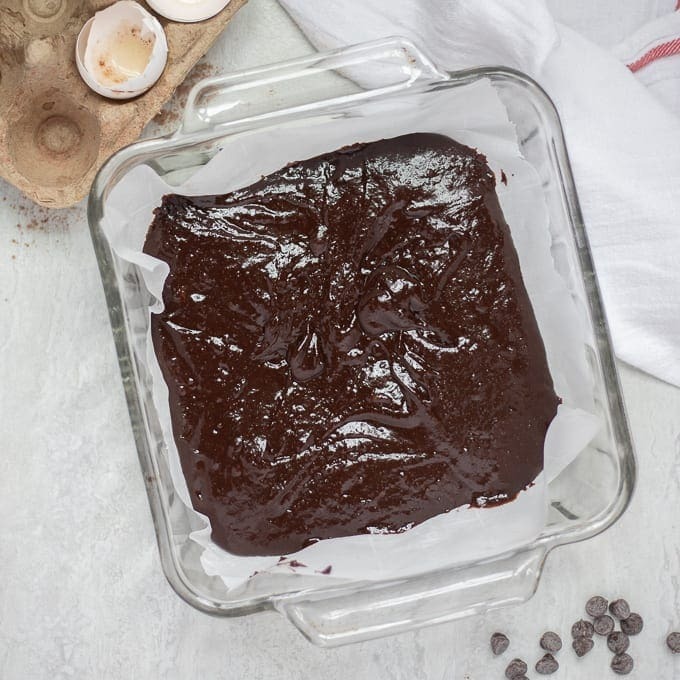 A glass baking dish works best to bake brownies, but in a pinch use an stainless steel pan. Ditch the boxed brownie mix, as this recipe for Easy Homemade Brownies makes fudgy, soft, moist brownies full of rich chocolate flavor! Preheat oven to 325 degrees. Line square glass baking pan with parchment paper. In small saucepan, melt butter over low heat. Add in espresso powder and sugar and whisk to combine. Cook over low heat for 2-3 minutes, until sugar begins to melt into butter, whisking often. Remove from stove and cool while sifting dry ingredients. 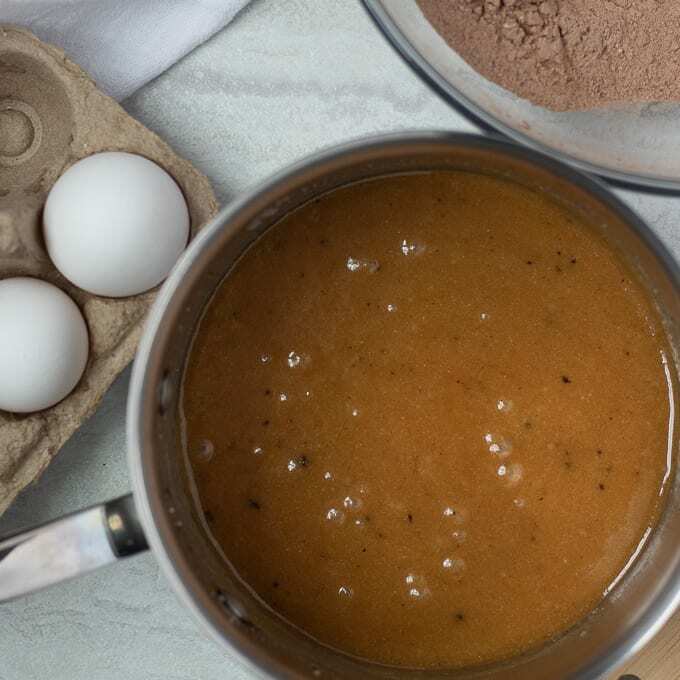 Sift flour, cocoa powder, salt, and baking powder into a large mixing bowl. Add in chocolate chips and toss to coat. Add butter mixture, vanilla, and eggs to dry ingredients. Mix together with wooden spoon or spatula until JUST combined. Do NOT overmix or brownies will become tough. Bake brownies for 30-35 minutes, or until the center is set, but still soft. A toothpick should come out clean with a few crumbs still attached. Hi there! These look great; however, I think you missed flour in the ingredients. Oh my goodness!!!! Yes, there is 1/2 cup flour. Thank you for catching that right away for me!!! These are very yummy. Totally fix a craving for chocolate. Thank you for sharing. These were so chewy and fudgy and decadent…my new go-to recipe!